ceiling tiles, and gasket materials. In both the OSHA Construction Asbestos Standard (29 CFR 1926.1101) and the General Industry Asbestos Standard (29 CFR 1910.1001) PACM is defined as thermal system insulation (TSI) and surfacing material found in a building constructed no later than 1980. TSI is the material applied to pipes, fittings (joints, "Ts", elbows, valves, etc. ), boilers, breechings, tanks, ducts or other structural components, generally to prevent heat loss or gain. 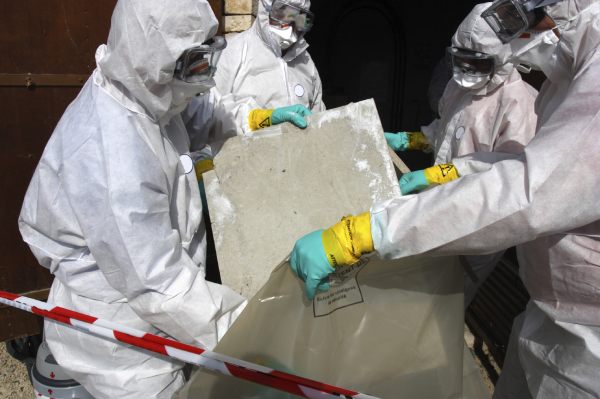 Unless an inspection of the premises has been completed by a certified expert in asbestos recognition and all the appropriate paperwork filed…….. Surfacing material refers to materials sprayed, troweled-on or otherwise applied to surfaces generally for acoustical, fireproofing, or other purposes. Examples of surfacing materials include decorative finishes on ceilings and walls, fireproofing on structural members, and acoustical plasters. 2)simply continue to treat the PACM as ACM (and follow all OSHA requirements for protecting the health and safety of workers and building occupants). Have a complete building inspection conducted according to the requirements outlined in the EPA AHERA (Asbestos Hazard Emergency Response Act) regulation. accredited Asbestos Building Inspector. All PACM (and suspect ACM, for that matter) would accordingly be included in this inspection. Collect and analyzing only samples of the PACM identified in a building. OSHA allows samples to be collected by either an accredited inspector or a CIH (Certified Industrial Hygienist). Samples must be collected in the manner described in AHERA. All general contractors shall be deemed to exercise general supervisory authority over work covered by this standard and shall ascertain that the asbestos contractor is in compliance. Class I, II, and III asbestos work; also all other operations where PEL is or may reasonably be exceeded Demarcated in any effective manner; critical barriers or negative pressure enclosures may be used; signs must be provided. to produce exposures above the Excursion Limit. For Category 1 and 2 work in a regulated area: daily monitoring representative of each employee’s exposure unless the employer has a negative exposure assessment for the entire operation. All other operations: periodic monitoring sufficient to document the exposure. If exposures are shown to be below the PELs by a statistically reliable method, monitoring may be discontinued. Additional monitoring is required whenever a change in process, control equipment, personnel, or work practice may produce exposures above the PELs. Employees and their designated representatives may observe monitoring. Employers will notify affected employees of the monitoring results, in writing or by posting. Category 1: Work includes the installation or removal of non-friable asbestos in which the asbestos fiber is locked in a binder such as cement, vinyl or asphalt which holds the material together. E Light Electric Service employees shall not participate in Category 1 work. Category 2: Work involves work with friable asbestos that is of short duration in situations which create low levels of airborne asbestos. Example of category 2 work are enclosure of friable asbestos, application of tape or sealant to asbestos, asbestos pipe insulation and minor removal of friable asbestos and minor installation, maintenance or repair work above false ceilings where sprayed asbestos fireproofing is present on beams. E Light Electric Service employees shall not participate in Category 2 work. Category 3: Work involves possible exposure to friable asbestos over long periods of time or work that generates high levels of asbestos. Included in category 3 work are removal projects where relatively large amounts of asbestos are removed from a building including removal of friable asbestos from structural material, cleaning or removal of heating or air handling equipment that has been insulated with asbestos. Also included in category 3 work are cutting or grinding of asbestos-containing materials using power tools. E Light Electric Service employees shall only conduct work in Category 3 and only as exposed during the course of their electrical operations, repair and installation. No E Light Electric employee shall conduct work that classified as Category 1 or 2.